Articles and white paper by Naomi Fine, esq. 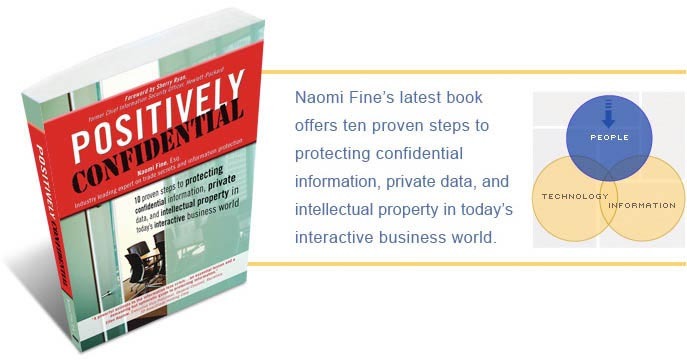 Filled with practical tools and detailed examples, Positively Confidential inexpensively and effectively motivates and engages all stakeholders in a positive, proven, and easy process to safeguard confidential business information, protect trade secrets, secure private data, and nurture intellectual property development. The result: trust, collaboration, profitability, and brand enhancement. Please don't keep Positively Confidential a secret! "Positively Confidential tells the truth: If you protect confidential and private information, you can positively change the future of your company and your position in it. Just as important, this book tells you how to do it. 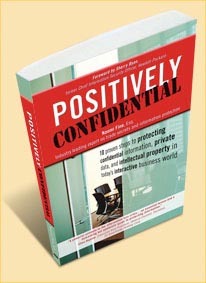 Positively Confidential empowers the reader to transform company information into intellectual assets. Naomi Fine makes it easy and compelling. A must read for every corporate citizen. It can inspire all of us to create a better future in our work and for our company."